If you've read Literate Lives much, you know that we are big Gordon Korman fans. 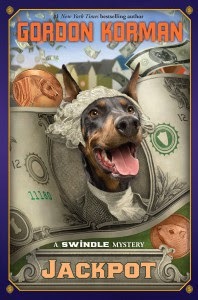 One of my first book reviews was about Swindle, the first in the series. I have since reviewed other titles in the series including Zoobreak and Showoff. I love them all, but the new one, Jackpot, may be my favorite. Gordon Korman has created a fantastic cast of characters for the books led by Griffin Bing, the man with the plan. In each book the kids are out to right a wrong or solve a problem. In all of them the group has followed Griffin's plan without question, even when they knew it might get them into trouble. In Jackpot, Korman changes things up a bit. The gang follows Bing in a plan to get even with their arch nemesis and bully, Darren Vader. They set him up to look all over town for a missing $30,000,000 winning lottery ticket. Vader begins digging through trash dumpsters and event he town dump. The group of friends wants to pull the plug on the operation thinking it's too harsh even for Darren, but Griffin resists and the plot continues. When the whole thing escalates and tourists from all over begin dumping trash in the streets looking for the ticket, the plan is revealed and the kids end up with community service, cleaning up all of the trash. Enter Victor Phoenix, the new kid who just moved in. At an assembly about bullying, brought on by the prank Griffin pulled on Vader, Griffin is singled out as a bully and Victor doesn't like that. He begins to move in on The Man With the Plan and Griffin doesn't like it. The entire gang turns against him and Griffin Bing is lured into helping Darren Vader, his enemy, to come up with a plan to find the ticket. Unbeknownst to him, his old gang, now led by Victor Phoenix begin working on the same plan. It all leads to a lesson learned by Griffin that he needs help to carry out his plans and will need to include his friends in the decision making more if he wants to keep his reputation as THE man with a plan. Once again, Gordon Korman takes the reader on and adventure that they can't put down. Just when you think you have it figured out, there is a new twist that surprises the reader and changes the story. My opinion of Griffin Bing went back and forth throughout the book, liking him and not liking him, sympathizing with him and then with Darren. Kids are going to love this latest addition to the series and I'm pretty sure it will be flying off the book fair shelves. Last week I posted the top 5 books selected by our Newbery Club here at Bailey. This morning we all met in the library to watch as the awards were announced. Nearly all 22 kids were present which I think is pretty amazing considering they had to come an hour early for the event. It may have been the doughnuts, but judging by their reactions when the awards were announced, I'm pretty sure it was the books too! Of the titles honored, I personally have read 4 out of 5. The only one I'm missing is Paperboy by Vince Vawter. I do, however, have it on reserve at the library, so that must count for something. Of the chosen ones, only one made it into the club's top 5, or even the top 10 for that matter. The beauty of it is, that one was the winner, winner chicken dinner, Flora and Ulysses: The Illuminated Adventures by Kate DiCamillo. I love that the committee once again picked a real kid friendly book, one that can truly be read and enjoyed by kids 9 - 14! 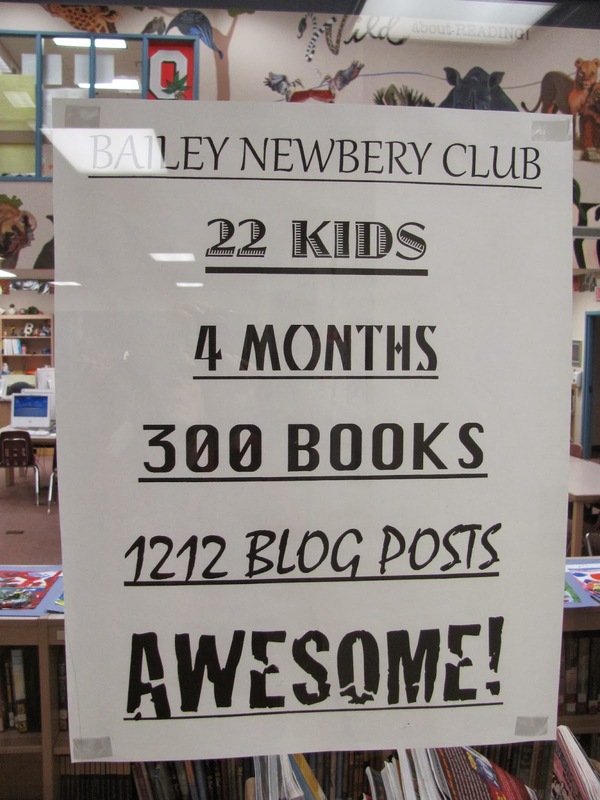 Of the 5 award recipients, our Baily Newbery Club was top notch. At least one student, and usually more, had read each of the titles chosen. I will miss meeting with my Newbery friends, it's always fun to be in the company of book lovers and these 5th grade students are just that, book lovers! I'm sitting here after school waiting to go to dinner with my friend Joyce before the fun and frivolity of Bailey Bingo begins, thinking about the Newbery Award. It sounds really nerdy, I suppose, but looking for Newbery has been something I've been doing for about 10 years now. For the last 4 I've included some of my closest 5th grade friends as we search for and try to predict the winners. I can't disagree with their choices and our survey is pretty unscientific, we're book people, not math people. So there you have it. Hopefully Monday, barring a snow day, we will meet in the library for the video stream of the presentations and enjoy a doughnut. After a 5 month hiatus, I think I may be ready to get back to Literate Lives on a more regular basis. Thank goodness for my blogging buddy, Karen who has kept things active without putting any pressure on me to hold up my end of things here. I'm not one for New Year's resolutions, so I won't make one here, but my goal is to post at least twice a week. Things have been a little busy and the Lovely Mrs. Prosser and I have been experiencing new things, good things, but things that took a little getting used to. For starters, we are empty nesters. Our son Steven, one of my final posts was about him, has completed his first semester at Ball State in Muncie, Indiana. The university has been a perfect fit for him, and in true freshman fashion, he has switched majors. He is now studying telecommunications looking toward video production. I'm excited for him and feel sure it is the right decision for him. He showed some real ability during his senior year of high school using simple cameras and editing software to produce some really awesome videos for his school. I know he will do well and Ball State has an amazing program in large part thanks to David Letterman. Our daughter Meredith is in her final semester at Ashland University, and like me, hasn't switched her major once in 4 years. She started in early childhood education and will finish her degree in May. She will start her student teaching this week in Sarasota, Florida. After 6 weeks there she will finish with 6 weeks in Celebration, Florida, the community started by Disney. I'm anxious to hear what she has to say about the differences she finds in the schools in Florida. In particular, the Celebration school which was begun with some very innovative educational practices. She wants to move south to teach to get out of this Ohio winter weather, and I don't blame her. We will be flying down over spring break to visit and spend some time where it's warm. I was invited by Meredith's professor to present the role of the elementary librarian and also gave them an intro to children's literature. It was an amazing experience to see the passion in these young teachers but I was little distressed to see their lack of knowledge about children's literature. All of this has been very exciting to watch as our kids move on to the next chapter and it has meant that The Lovely Mrs. Prosser and I have had to get used to being just the two of us. It's meant more dinners out and finding things to do with all of the time we spent chasing them around for the last 22 years. The house is a lot quieter and we wonder what they're up to when we don't hear from them for a while, but all in all, it's been a pretty easy transition and I'm glad to report that we still enjoy spending time together. So like I said, my plan is to post twice a week, and hopefully I'll have something to say that will interest our readers. I'm looking forward to getting back because I know I'm a better teacher when I'm writing consistently. There are a multitude of things I could celebrate about the holiday season - time with friends, time with family, time to relax a bit. I could wax on about any of these for quite awhile, but I've decided to take another tack today. As I mentioned in my post about my #OLW, my mom just recently had a hip surgery to remove a hip replacement put in last May. Turns out her prosthetic got very infected and needed to come out while she undergoes a course of heavy antibiotics. Then she will have another hip replacement in six to eight weeks. I am definitely not celebrating those things. However, I am celebrating the gift of time spent with my mom. Because her hip surgeon is in the city where I live, Mom had surgery in the area and is now doing all her rehab in a lovely facility not even 10 minutes from our house. Since I moved from my hometown after college, I have never lived in the same town as my mom. It has been a huge celebration that I will get to see her almost every day for the next three months as she convalesces. Each day, I pack up my bag with goodies -- cards, magazines, the Jumble from the newspaper, clothes that I have washed for her, snacks or leftovers -- and drive the ten minutes to see Mom. The Jumble is one of the first things we do after I unpack; she loves unscrambling words and then trying to solve the riddle. It is wonderful for me because as we talk and solve, I can see progress each day in the way she thinks and attacks problems. Mom also loves to play cards; we have played numerous games of Gin Rummy. And the conversations we have are plentiful. However, as she looks ahead to this long rehab, with a major surgery looming in the middle of all it for her and a surgery for my dad next week in our hometown, Mom has taken to questioning whether it's worth it. Some days, she feels sorry for herself and doesn't feel like she's making any progress. After a few days of that kind of negative talk, I reflected on this community of celebration Ruth has inspired. I realized I needed to have Mom write about her celebrations, no matter how small, so she can see her progress each and every day. So, I bought her a journal, and together we have begun a new ritual. Each day, she needs to record at least two successes or things she wants to celebrate. Thursday, she had her hair done in the beauty shop housed within the rehab facility; let me tell you, that item took the #1 slot that day! The #2 slot was the fact that she had her nails painted (a service the activity directors provided). After feeling and looking bad for that long, what woman wouldn't list those personal grooming items high on their list?!! Mom is anxious about many things and sometimes wakes up at night and just stays awake. Two nights in a row, she woke up and was able to put herself to sleep again. Her appetite was greatly diminished right after the surgery, so when she ate her entire lunch two days in a row, that made the celebration notebook. There is something so concrete in recording these celebrations on paper, and then being able to refer back to them. Mom seems to like the journal as well; the other day I got there, and she had already recorded her celebrations (up until then, I had done the writing). Being able to share conversations, Jumbles, and celebrations with Mom has truly been a lovely gift for me. For more celebrations, head on over to Ruth's blog to see what others are celebrating. Thanks so much to Ruth for giving us a forum to celebrate. I have been thinking a great deal about the One Little Word that could help guide my life for 2014. I recently read a blog post from Clare that talked about "grit" - what a great word that would be. Recently Julie blogged about the gift of "time." Last year, my friend Katherine, chose "be." This year, she chose "balance" - that is a word that I need every year. Another fabulous word to remind her to stay in the moment. All great words, and any one of them would work for me. But I really wanted to choose something unique to where my life is right now. Last year my word was "joy," but 2013 was a very difficult year for our family, so I found it hard to get to that word as frequently as I would like. The first few months of 2014 will be a bit rocky as well - my mom will have two hip surgeries within a 3 month span (she already had one) with all the rehab that accompanies such a surgery, and my dad is scheduled to have a complicated back surgery the first full week of January. I need to choose a word that will guide my life this year, but will also help me navigate the all-too-real issues I will face in the upcoming months. My hope is that the word "kind" will accomplish all of that. Kind - to both of my parents as they recover from their respective surgeries, and begin the understandable cranky attitudes that come with convalescing. Kind - to my classes. This task is made much easier by my present classes because they are so amazing already. Our school motto this year is "Choose Kind;" having that read each day on announcements and posted throughout the school will serve as great reminders. Kind - to my colleagues. Teachers are under a great deal of pressure right now; I see it daily with staff in our building, and if I can help alleviate even a bit of that pressure with a small kindness, that would be wonderful. Kind - to my family and friends. Why is it that our families, especially, tend to get the "leftovers" of our energy and attention? I want to be a kinder person to the people whom I love so dearly. Kind - to myself. Without this piece, I don't think any of the others work. I need to be kind to myself, making sure I eat properly, get regular exercise, sleep well, and make time to do the things I enjoy. 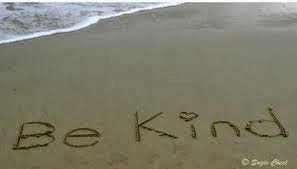 If I am not kind to myself, it will be much more difficult to achieve the kindness to others. Wishing you all a very happy (and belated) New Year!